We have specialized in wooden longbows, handcrafted from yew, for over 25 years - longbows, flatbows, self bows! Every solid Pacific Yew bow is from a tree that Clark harvested, seasoned and crafted into a bow himself. The Pacific Yew used for the self-backed traditional longbows is harvested in the rainforest of the West Kootenays, B.C. Staves are seasoned for up to ten years and crafted with precision. Self backed yew longbows have been used for centuries, often out performing other bows for strength, durability, and beauty. The creamy white sap wood of the Pacific Yew is showcased in a self backed longbow. When a bow is drawn, the back of the bow is under tension and the belly of the bow is compressed. Not only is the contrast between the heartwood and the sapwood a thing of beauty, the combination naturally provides strength and resilience under this tension and compression. Smooth and silent shooters, the traditional wooden bows handmade by Clark will last a lifetime with the proper care. Leather handles add to the comfort and beauty of the yew longbows. The longbows are finished with several hand rubbed coats of oil and waxed for a durable finish. There's nothing like shooting a beautiful yew wood selfbow! 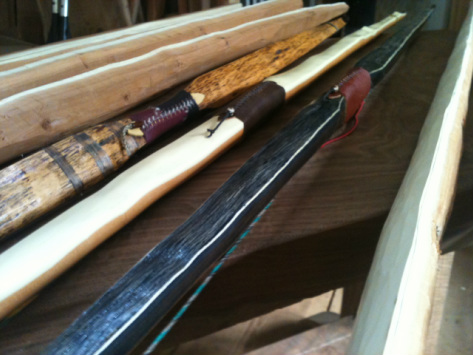 Ask about traditional/primitive longbows on the rack and/or custom yew longbows made to your specifications. One in one hundred Pacific Yew trees will yield a few staves. Split yew will season for a minimum of seven years. The yew staves in these photos were harvested as value-added in an eco-certified community forest.